Dates: February 28 - March 1, 2012. Venue: Pavilion 1, Hall 1, Crocus Expo, Moscow, Russia. February 28 - March 1, 2012 at IEC Crocus Expo there were held the 4th edition of Polyurethanex - 2012 Exhibition – a leading international specialized event in polyurethane industry in Russia, where full range of manufactures of raw materials, equipment and finished products of polyurethanes is widely introduced. The target of the Polyurethanex is to boost the Russian polyurethane market, development and introduction of polyurethane technologies and materials in different branches of industry: automobile manufacturing, construction, chemistry, furniture and shoe making, and others. In comparison with the last year display area increased by more than 50 percents. Over 30 exhibitors took part in the show from 9 countries (Russia, Ukraine, USA, Germany, Italy, Sweden, United Kingdom, China, Netherlands). Among the exhibitors were the following companies: Chemtura, Huntsman, R.M.P.A. Srl, Biesterfeld Spezialchemie Rus LLC, Chem-Trend GmbH, Evonik Goldschmidt GmbH, Zelu Chemie GmbH, Polion-P NPP JSC, FKP Permsky Gun-Powder plant, Momentive Performance Materials Rus LLC, Polyols Plant LLC, H&S Anlagentechnik GmbH», S.P.B. NPF LLC, Himpostavschik M JSC, Chimex Limited JSC, and others. At the Polyurethanex - 2012 there presented the following some brand new materials and products: Momentive Performance Materials supplies major urethane additive products including Silicone surfactants, catalysts and process modifiers. New Products: Low VOC Silicones for Slabstock applications (Niax* Silicones L-820, L-559, L-2115, L-629, etc. ); Emission free catalysts (Niax Catalyst EF-867, EF-890, etc. ), Low emission process additives (Niax Flame Lamination Additive FLE-200LF). ZELU CHEMIE GmbH is one of the leading PUR system houses for formulations of automotive air panel filter foams. It presented newest developments in the area of energy absorbing body protection foam systems or environmentally friendly flame protected high resilience foams for office chairs or railway seats. February 29, 2012 within the business program of the exhibition there were held the Current State and Prospects of Development of Production and Use of Polyurethane Materials in Russia, 4th International Practical-Research Seminar which contained the specialists’ presentations of BYK-Chemie GmbH (Additives BYK-Chemie company for Polyurethane Applications), Honeywell Fluorine Products (Low Global Warming Potential Blowing Agents), H & S Anlagentechnik GmbH (Conversion of flexible PU foam residues into polyol in industrial scale) and Chematur Engineering AB (MDI and TDI Manufacturing Overview). Srtizhova Larisa - Technical Adviser Plastics Additives of BYK, Hubers Sascha - Technical Consult Ambient Curing Resins, BYK-Chemie GmbH, Germany. At the same time with Polyurethanex, the International Specialized Exhibition Composite-Expo ran for the fifth time and allowed a wide range of specialists to get acquainted with innovation technologies of manufacturing and samples of finished products of composite materials for different branches of industry. Over 70 exhibitors took part in the show from 18 countries (Russia, Belarus Republic, Ukraine, Lithuania, USA, Austria, France, Germany, Italy, Hungary, Macedonia, United Kingdom, Luxemburg, China, Turkey, Finland, Netherlands, Brazil). February 28, 2012 within the business program of the Composite-Expo exhibition there were held the Current State and Prospects of Development of Production and Use of Composite Materials in Russia, 5th Practical-Research Conference, organized by Union of Composites Manufacturers and Mir-Expo Exhibition Company LLC. Independent audit check of statistic figures were fulfilled for the first time during Composite-Expo and Polyurethanex exhibitions. According to the experts on the space of 3300 sq. m. there situated 103 exhibitors, including 54 national (domestic) companies and 49 foreign ones from 19 countries. Over 4800 people visited the shows and 97 % of them were specialists in different fields of industry. It is evidence of the growing demands of the Russian market to use modern innovation materials and technologies in different industries. Huntsman is a global manufacturer and marketer of differentiated chemicals. Its operating companies manufacture products for a variety of global industries, including chemicals, plastics, automotive, aviation, textiles, etc. Huntsman today has 10,000 employees and operates from multiple locations worldwide and revenues approximately $10 billion. Himpostavschik company would like to thank the organizers of the exhibition "Polyurethanex 2012." Underline the high level of information support and organizational work done, before and during the exhibition. With your help we have successfully negotiated with the leading producers and consumers in the developing areas of polyurethane foams, which were presented as counterparts national and foreign markets. 4th edition of Polyurethanex was a success for organizers, by no means. Our company took part in this show for the first time as an exhibitor and in spite of size of the event; we met a considerable quantity of professionals who visited the show. It is also defined by the good program of the Seminar being held within the Polyurethanex 2012. However, the event has been growing in number and quality of exhibitors and visitors every year, and we are especially happy about it against the background of recently ineffectual large-scale industrial trade shows. Especially I’d like to mention a clear and simple move-in & move-out procedures of product samples. 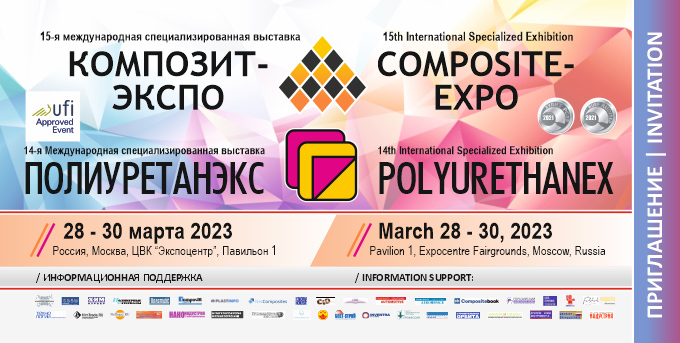 The majority of the exponents showed the intention to take part in the 4th International Specialized Exhibition Polyurethanex - 2013 next year. It’s planned to be held in February 26 - 28, 2013 in Crocus-Expo, Moscow.